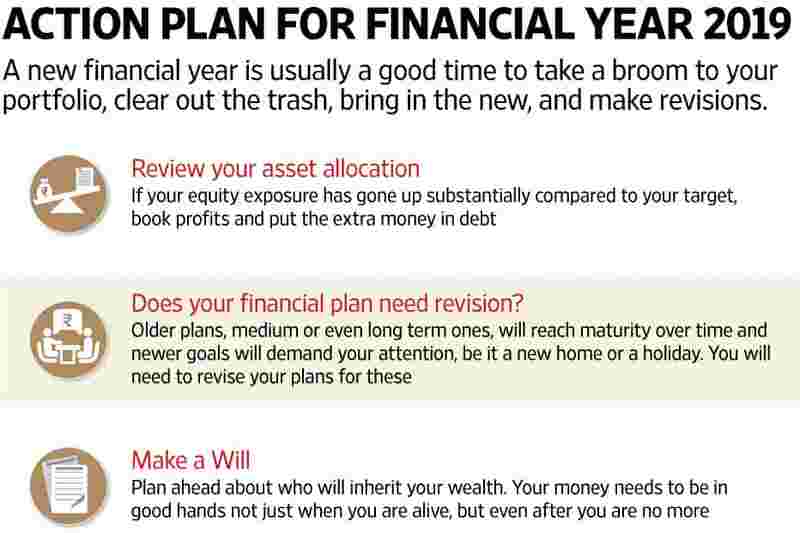 A new financial year is on the horizon. And although Mint Money recommends periodic review of your portfolio, the start of a new year is generally a good time to do a clean-up. And when equity markets have also gone up sharply (28% rise in 2017), it’s always a good idea to take stock of your portfolio and do some hygiene checks, like checking if your allocation has tilted too heavily towards equities. But that’s not the only thing you should check. Here are a few more things to look at. Everyone’s talking about mutual funds these days and fund houses too have been saying that inflows have gone up. But take a look at the inflows. In April 2016, fund houses got Rs3,122 crore through systematic investment plans (SIPs). By April 2017, investors were investing close to Rs4,300 crore through SIPs and in January 2018, they had invested Rs6,644 crore. Investor folios have also gone up. Retail equity folios grew 42% between December 2015 (around 33.8 million) and December 2017 (48.1 million). The number of high net worth individuals in mutual funds too grew between December 2015 (around 860,000) and December 2017 (1.7 million), almost double on an absolute basis. Much of this has been on the back of rising equity markets: the S&P BSE Sensex went up by 28%, the S&P BSE Midcap index grew 48% and the S&P BSE SmallCap index grew by 60% in 2017. When markets go up that much, it’s a good time to cut back on your equity exposure if—as per your asset allocation—your share in equity assets has gone up disproportionately. Equity markets have since corrected and Mint Money has been advising you to check your asset allocation. Kunal Valia, director, head of funds and exchange-traded funds, Credit Suisse Wealth Management India, says that given the sharp rise in Indian equity markets over the last 2 years, “investors’ asset allocation has been sharply tilting towards equities in general and mid- and small-sized companies in particular. Valuations in Indian markets are high and bond yields in the US, Europe and Japan are also on the rise, which would lead to interest rates there going up eventually. In such a scenario, avoid a high equity exposure, because equities become riskier and volatility can go up." Valia recommends reducing exposure to mid- and small-cap funds. As far as debt funds are concerned, investors can also look at corporate bond funds on account of rising yields in the Indian debt markets. Even if you have a detailed financial plan, your job is not done. New goals can turn up; some old goals, for which you had been saving for, would hopefully have been met. What about some new loans you may have taken on? You need to budget for them. Then again, there could be some unexpected setbacks. Prakash Praharaj, founder, Max Secure Financial Planners, and a Securities and Exchange Board of India (Sebi) registered investment adviser, tells us that one his clients, Anay R. Mahajan, had taken an education loan of Rs25 lakh last year for his son to study abroad. The bank was supposed to disburse the amount in four instalments on a quarterly basis, that is, the entire amount in the first year itself. Mahajan told us over phone from Pune that after disbursing two instalments, the bank backtracked and refused to pay the remaining amount. “The bank told me that it would now pay me the amount only in the final year (5th year) of my son’s education. It said, its internal audit raised an objection to disbursing the entire amount in the first year itself. But I needed the entire amount in the first year. My calculations went for a toss," he said. “In this case, Mahajan has to now arranged the money out of his own resources. This made it necessary for him to revisit his portfolio and reassess his monthly SIPs because now, obviously, his SIPs would reduce," said Praharaj. Mahajan told us that he has no option but to arrange the remaining money himself, which he said he could do but only out of the investments for his own retirement corpus and those meant for education and wedding of his younger daughter, who is 11 now. Had Mahajan’s bank disbursed the entire amount as per the committed timeline, his son would have taken on the responsibility of paying back the loan after he got his first job. That would have given some relief to Mahajan. Salaried individuals have another reason to revisit their portfolios in the new fiscal. “Assuming you get a salary hike every year, ideally your SIPs should increase as well. So, top up your SIPs," said Praharaj. Financial experts complain that most of us ignore nominations and making a Will. Ideally, you need to plan your succession every time you open a new folio, because your money should pass into the right hands after you are gone. One of the surest ways of doing this is to have a Will. This way you can ensure that your money is passed on to the person you want to have that money. You can have multiple beneficiaries if you wish. A Will supersedes nominations and even joint holdings. For instance, if A is your second holder in a mutual fund investment but you specify in your Will that B should inherit all your mutual fund investments, then your Will takes precedence over your co-holding pattern in the mutual fund. Additionally, you could also have a co-holder or a nominee in your mutual fund holdings. A nominee is not the heir of your money; she is just a trustee. “Normally, since a nominee is also a family member, she assumes that she has inherited the money. However, as per law, it will become her responsibility to ensure that the money reaches the rightful heir after you die," said Raghvendra Nath, managing director and founder, Ladderup Wealth Management Pvt. Ltd.